Weak global risk sentiment and falling oil prices put the hurt on the Loonie this week, making it one of the worst performers among the major currencies! Global risk sentiment was likely the contributing factor to the Loonie’s relative performance this week, and for a broad rundown of what drove global risk sentiment, check out my review of this week’s drivers and broad market behavior in my Japanese yen weekly review here. In short, we saw early risk-on sentiment to start the week (likely a carry over from Friday’s bullish sentiment on positive U.S. data) that had the Loonie in the positive against the majors with exception to the other “high-yielders” (AUD and NZD) and the Greenback. 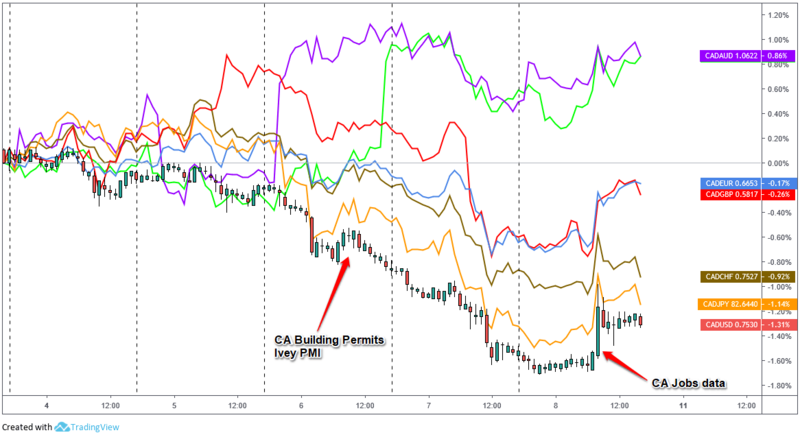 But traders turned bearish on risk assets from Wednesday on as the picture of global growth turned gloomier, mainly on a heavy week of negative economic reports from around the globe including weak business sentiment survey data from Canada. The gloomy outlook on global economic growth not only put pressure on “riskier” currencies like the comdolls, but on the price of oil as well. Oil actually had a pretty rough week on its own as Venezuela sanction concerns faded and reports of rising U.S. supply data had oil traders pushing the sell buttons all week. Global risk sentiment bounced towards positive going into Friday to help the Loonie climb higher into the U.S. trading session, but the big drivers for Loonie bulls was the single top tier event from Canada on the week: the monthly Canadian employment report. The employment data was a mixed read as the net job adds surprised way to the upside at 66,800 jobs versus the 8,000 forecasted by a Reuters poll, but the unemployment rate ticked higher to 5.8% with more people joining the workforce. 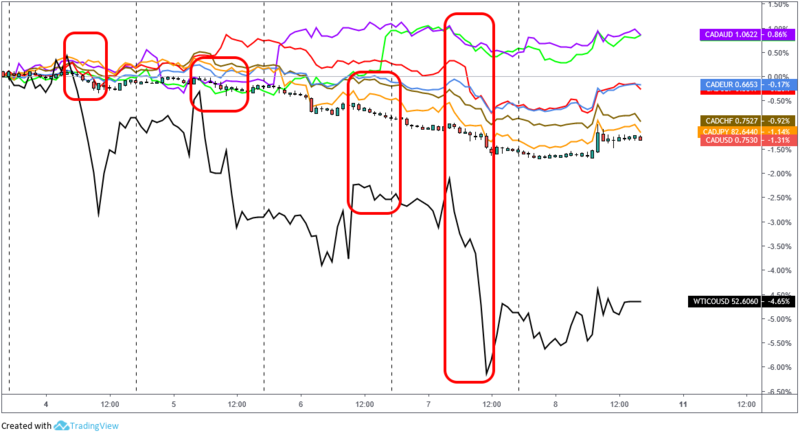 So while we saw an initial reaction to buy up Canadian dollars on the headline read, it was a limited upside move as traders priced in the full data. And unfortunately for Canadian dollar bulls, it was not enough to get more Loonie pairs back into the green overall, placing it as the third worst performer among the major currencies for the week.